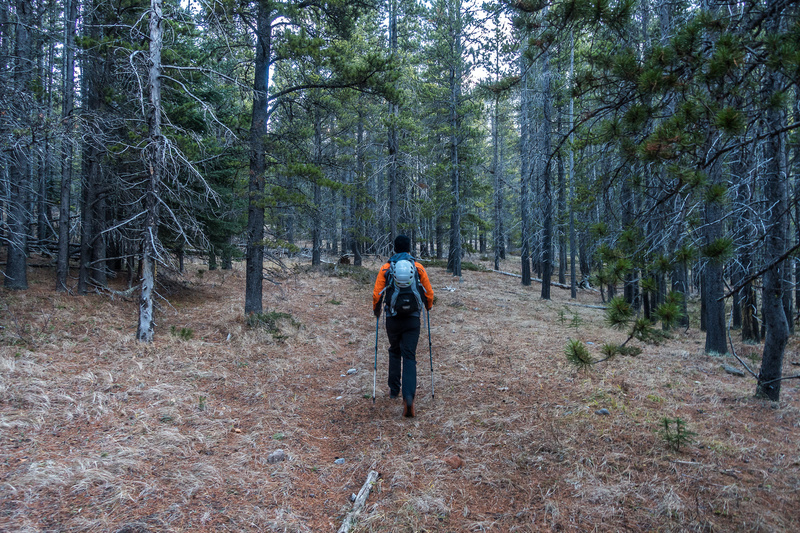 Difficulty Notes: Access from the west involves getting permission from landowners. 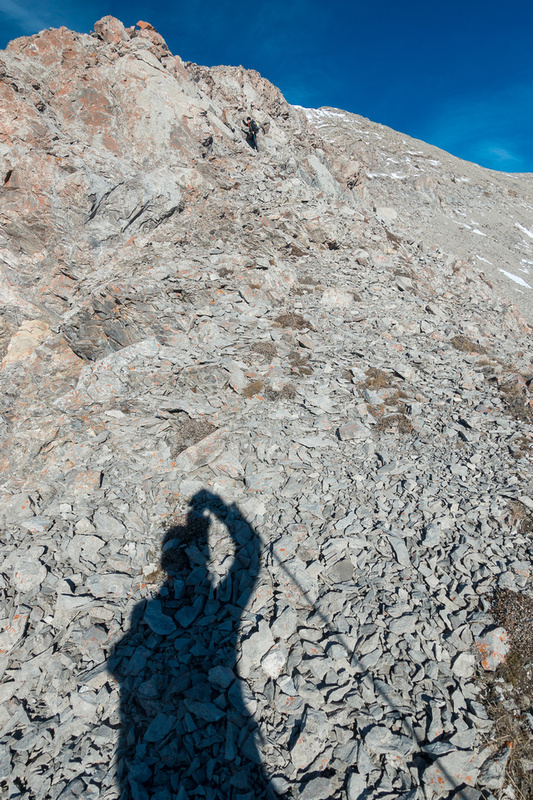 Some slabs and routefinding but mostly hiking and easy scrambling. Note: We did both Centre and Caudron Peaks in one trip combining for the stats listed above. 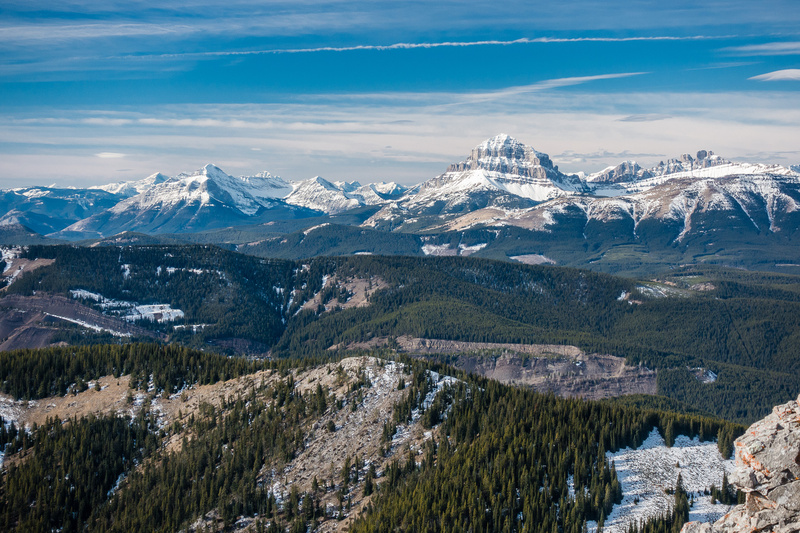 Ever since reading a pair of trip reports from Brandon Boulier which detailed winter scrambles up both Centre and Caudron Peaks in the Livingstone Range near the Crowsnest Pass in Southern Alberta, I’ve wanted to do them both as a day trip from the west. Most folks ascend only Centre Peak and they do it from the east side – an easy to moderate, or even difficult scramble, depending on the route chosen. 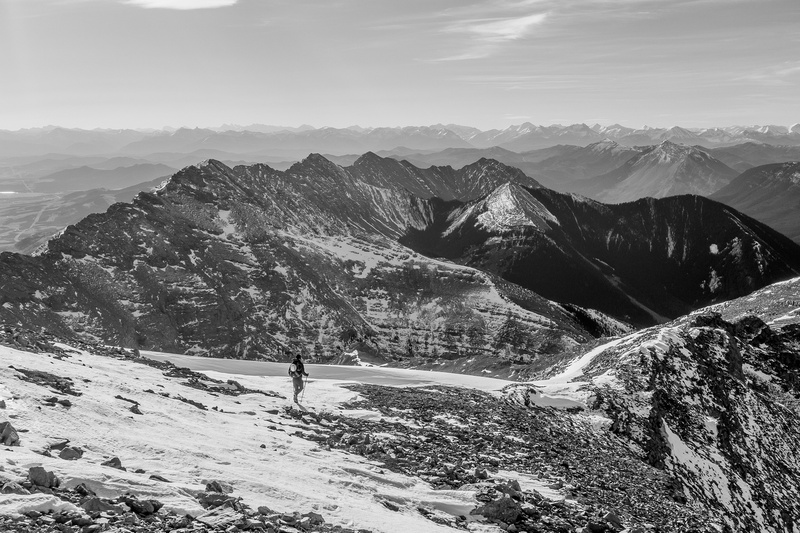 Rick Collier did both peaks as part of a grand traverse from Thunder Mountain to the Crowsnest Highway. Brandon gave me some key beta, including the advice to avoid his approach route on Centre and use his descent route instead. Private property abounds in this area and you must cross it whether approaching from the east or the west. I know some folks have (unwittingly?) crossed these properties without going through the trouble of contacting the landowners and obtaining permission but I strongly discourage this practice. 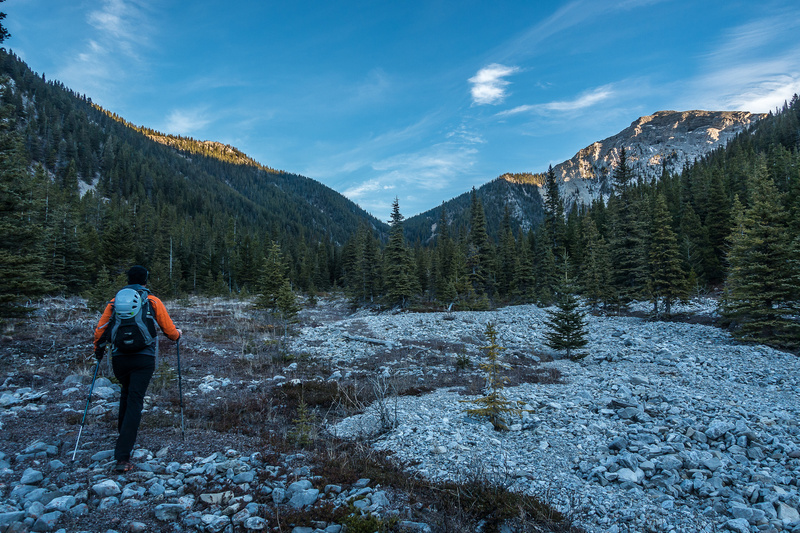 If too many people ignore private land by tramping across it without permission, the peaks that are accessed through it will become permanently cut off from anyone else. 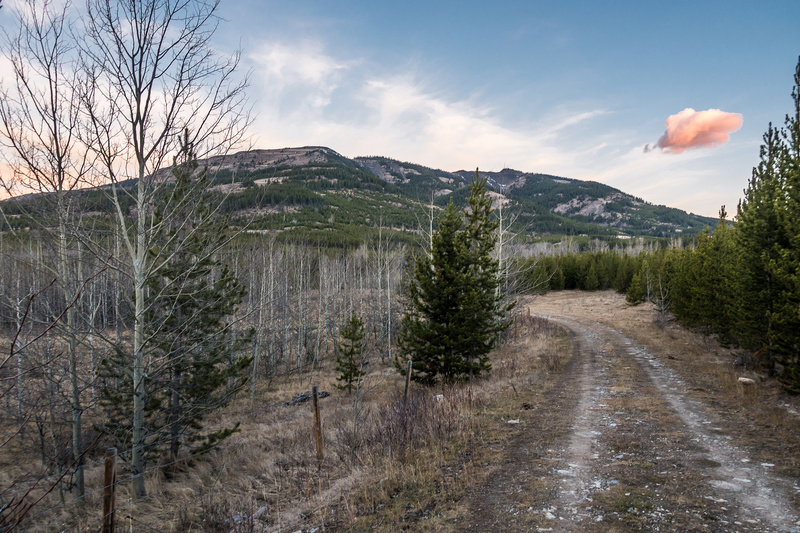 A few weekends before this trip, Phil Richards and I were surprised to find ourselves staring at a gate along the road from Blairmore up towards Grassy Mountain. We decided to turn around and do another trip rather than trespass. On hindsight this was a great idea considering the various landowners in the area and all the parties involved. Our Routes up Centre and Caudron Peaks. It took me about a week to find and chat with the various landowners on either side of the Livingstone Range, and I found most of them to be very pleasant to deal with. For obvious reasons, I’m not going to divulge their contact information on my public web site but you can contact me privately and I’ll do my best to assist you. I can tell you that on the east side, it is NOT the Hucik family that you should be talking to (despite hints to that effect on peakfinder.com), so don’t bother anyone with that last name. On the west side there are multiple landowners, some are friendlier than others and you should be aware that Brandon’s group got lucky with their approach as they were parked on property belonging to the less friendly variety. Put it this way – I strongly discourage you from using the same parking spot and initial approach that Brandon used. 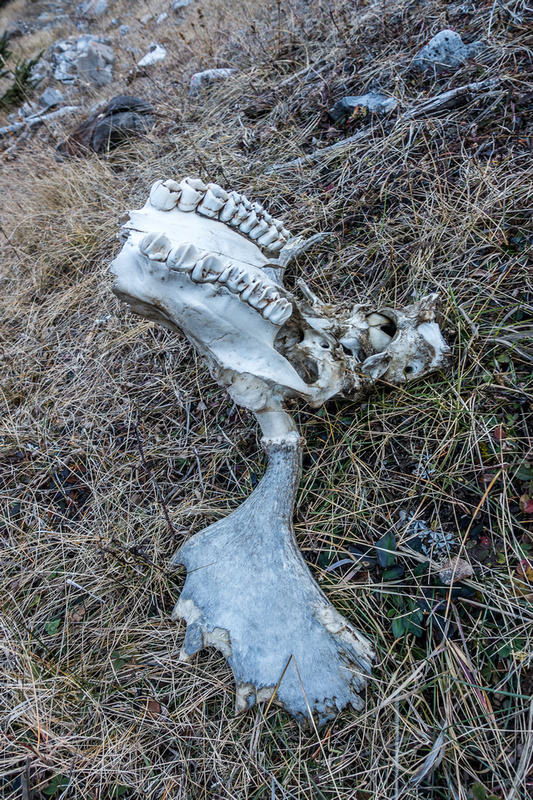 Driving up the west side of the Livingstone Range from the town of Blairmore eventually puts you on a road owned by Riversdale Resources and subsequently on land owned by other private parties. You must obtain permission from all parties to drive or park on these roads! 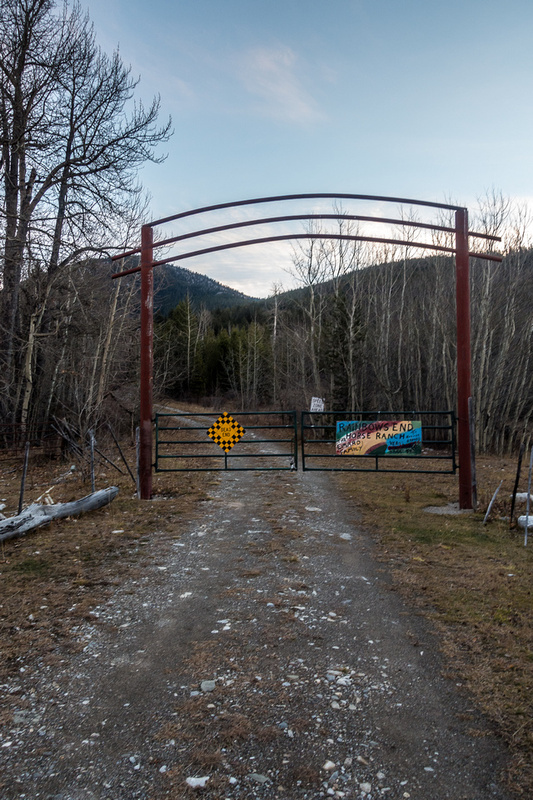 The first permission you’re going to need in order to access Centre / Caudron from the west is from the Riversdale Resources mining company that is vying for rights to lob the top off of Grassy Mountain in pursuit of Metallurgical Coal. I found the local Riversdale contact, Keith, to be extremely friendly and helpful in granting me permission to drive their road and providing me valuable information on other landowners that I needed to garner permission from in order to approach the Livingstone Range from the west. Access from the east is easier and shorter, but bagging both peaks would mean a TON of elevation gain and loss – over 2200m of it! 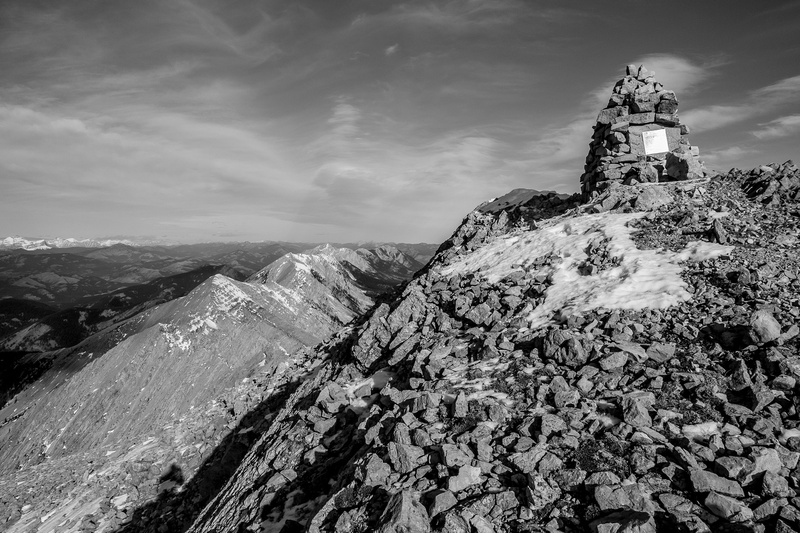 Again – permission to hike on private land MUST be obtained if you are interested in scrambling up Centre Peak from the east. 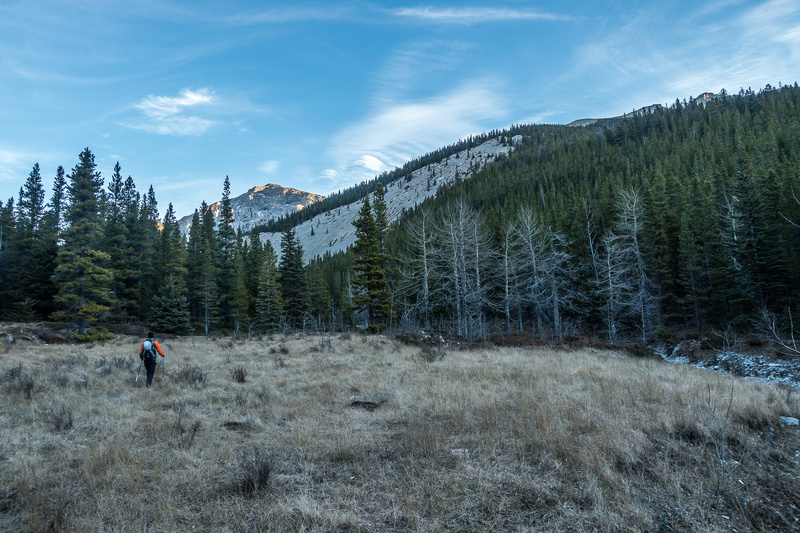 The first part of the hike into the Caudron Creek drainage and access for either Centre or Caudron Peak from the west involves driving, parking and hiking on privately owned land. Phil Richards and I went back and forth on which direction we wanted to use for our ascent. You might assume that the west access is the only good choice, but considering the number of landowners and potential issues we were facing from that side, and the shorter / easier approach from the east, we strongly considered the east approach before finally settling on the west one. The 2200m total elevation gain required to bag both Centre and Caudron from the east was what finally settled it for us. We knew that going all the way up Centre, then down and up Caudron and then down and up Centre AGAIN before finally heading down to the east was just plain dumb. And while dumb ideas haven’t stopped us from having ‘fun’ in the past, we like to think we’re slowly learning to make reasonable choices. Yeah right! 😉 Put it this way – if you’re only interested in Centre Peak, I would recommend an approach from the east. You’ll only have to deal with one landowner and the route is much shorter and less involved than from the west side. After all of the planning, cold-calling various landowners and mapping out different routes for our drive and approach, climbing the darn mountains themselves seemed like it was an afterthought rather than the main event! 😉 As Phil and I drove up the road along Blairmore Creek towards Grassy Mountain, we wondered how dry our route would be. We were hoping to scramble it in light approach shoes if possible. Our first surprise of the day was coming across a closed gate for the Riversdale portion of the road! My initial thought was that I wasn’t clear enough with Keith that we would be needing access on Saturday but we soon discovered the gate wasn’t locked. PHEW. On the very well-built road leading alongside Caudron Creek (L) towards Caudron Peak which rises impressively in the distance. Centre Peak is out of sight to the left here. The road was in decent shape and soon we were turning down a smaller side road towards other private properties. This is where we encountered our second closed gate of the day. Thankfully there was a route around this one and soon we were parked at the third closed gate of the day – but this was expected and marked the end of our approach drive. We set off up the road through the private property that we had permission to cross easily following the route that I’d mapped out using Google Earth beforehand. 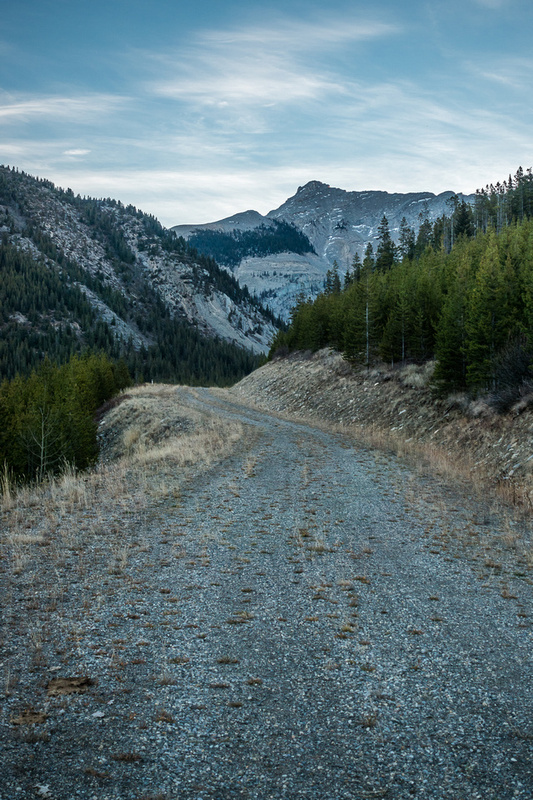 Soon we were on a surprisingly large and well graded gravel road that led east, up the Caudron Creek drainage. Our view of Caudron Peak was intimidating from the approach – it looked harder than advertised, especially up near the summit block. I had information that there was a trail alongside Caudron Creek below us on our left, but the road was easy to follow so we stayed on it until it finally ended at a huge gravel platform with a capped gas well at its center. 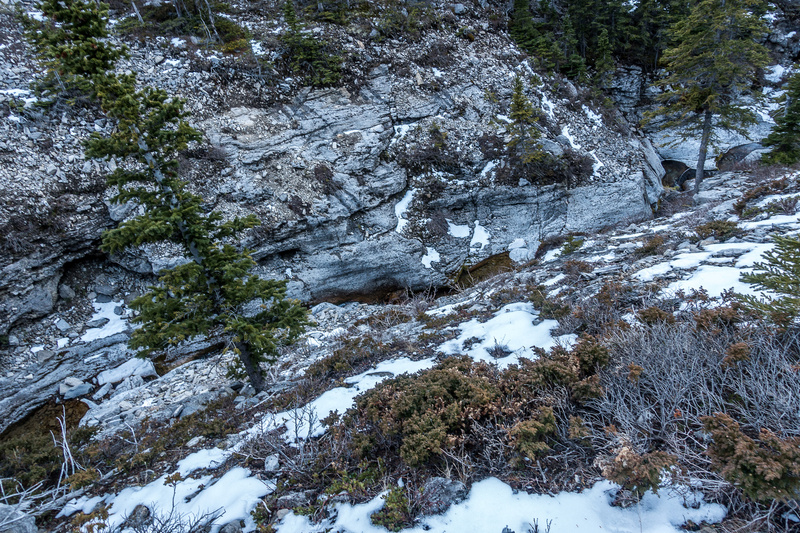 From the large gravel platform at the end of the approach road, we descended to Caudron Creek and picked up the obvious trail on its left (west) side. Where the old ATV track crossed the creek towards Caudron, we stayed on the left side and continued on towards Centre Peak. We ‘enjoyed’ staying either in the creek bed itself or on either side of it, depending where the bush and debris were less oppressive. As the creek turned left up the drainage between Centre and Caudron we stumbled up gravel and boulders on fresh snow and through the occasional alder or two. 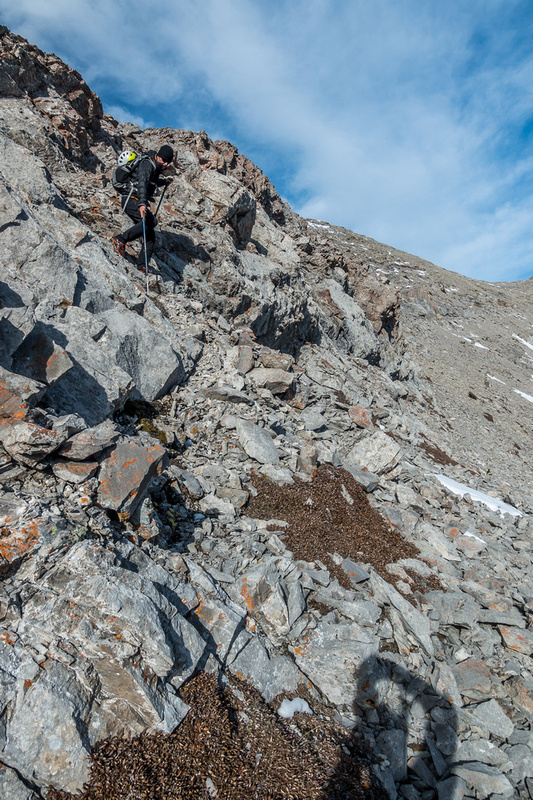 So far the route had been fairly obvious, but looking up at the approach (west) ridge that Brandon had used on our left, I wasn’t 100% sure where we had to ascend up Centre to get onto the south ridge. As we followed an increasingly choked up creek bed, I suddenly noticed a flash of brilliant white moving rapidly up a scree slope nearby. This was the first long-tailed weasel I’ve ever seen in the wild. Apparently their numbers have been declining rapidly. We continued up the drainage before Phil started asking if maybe we were a bit too far. He could see some cliffy terrain ahead that didn’t seem to fit Brandon’s description. Sure enough! When I decided to look at the GPS I realized we were too far upstream. We briefly debated sticking right in the drainage but there had to be a reason Brandon didn’t do this (and there was). 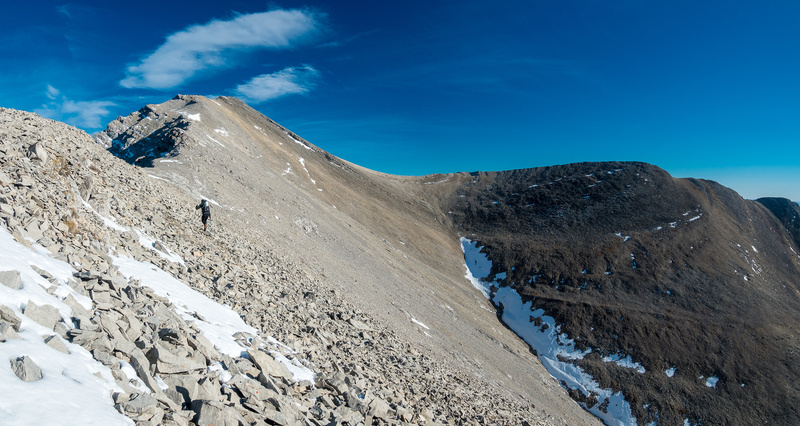 We decided to start ascending a steep scree slope to our left before contouring back around slabby cliffs to gain access to a large scree bowl leading up to the south ridge of Centre Peak. Finally in warm sunshine and on the scree slope to the south ridge. On hindsight our mistake actually turned out great. We ascended loose slopes above the creek on it’s north side, contouring back around to the west before groveling up a large, loose scree gully to the south ridge high above. Views to the south towards Caudron and west towards Crowsnest Mountain kept improving the higher we went. 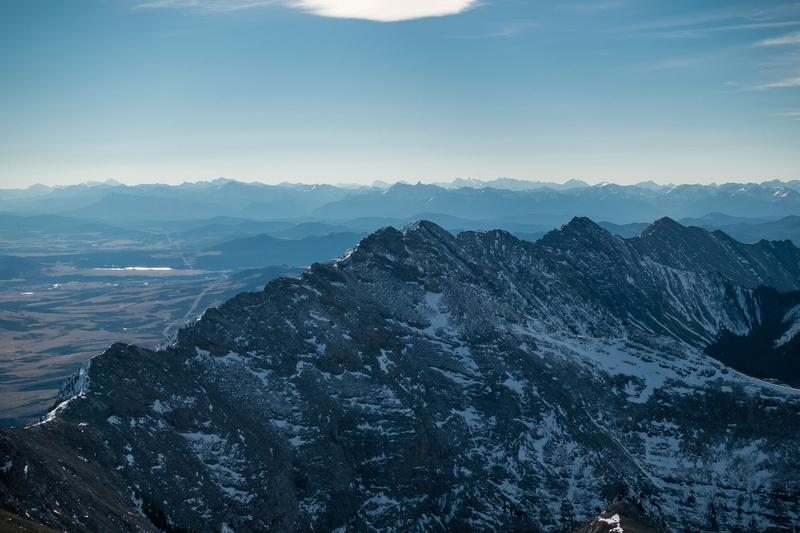 The weather was very warm for November, but the wind was getting pretty strong as we finally gained the upper south ridge and finally got our first views of Centre Peak in the distance – still high above us. We stuck to the east side of the south ridge whenever possible on ascent to avoid the strong west winds. 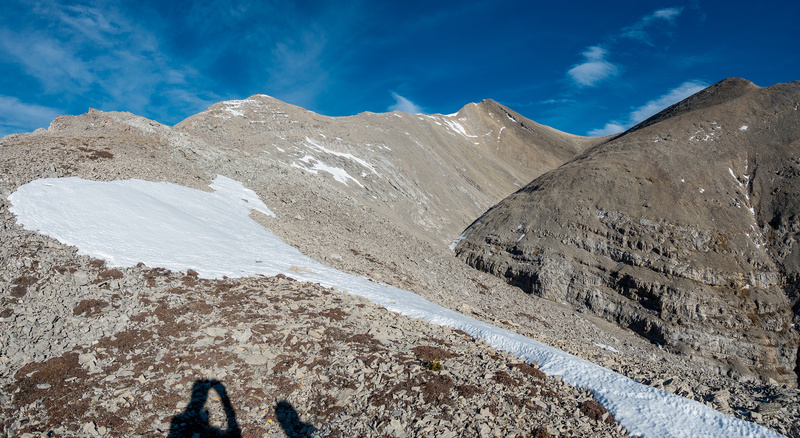 Despite the strong winds, we both enjoyed the south ridge of Centre Peak. The views were excellent in every direction and the terrain was fun, easy scrambling on pretty good rock and scree. As we approached the final slopes to the large summit cairn, the wind became especially fierce. Several times we were forced to sit down or risk being blown off balance! I managed to tuck in around the huge cairn for some relief as I took in the amazing views in all directions. Thankfully the wind wasn’t too cold, thanks to the unusually warm temperatures. Looking west and north along the Livingstone Range as we approach the summit – still a long ways off. 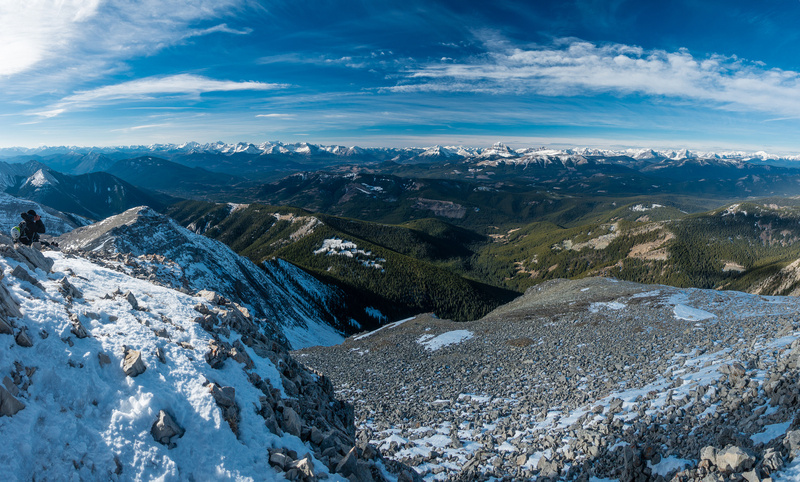 Great views over McGillivray Ridge and Ma Butte towards Crowsnest Mountain and the Ward / Window / Allison. Looking west off the summit of Centre. 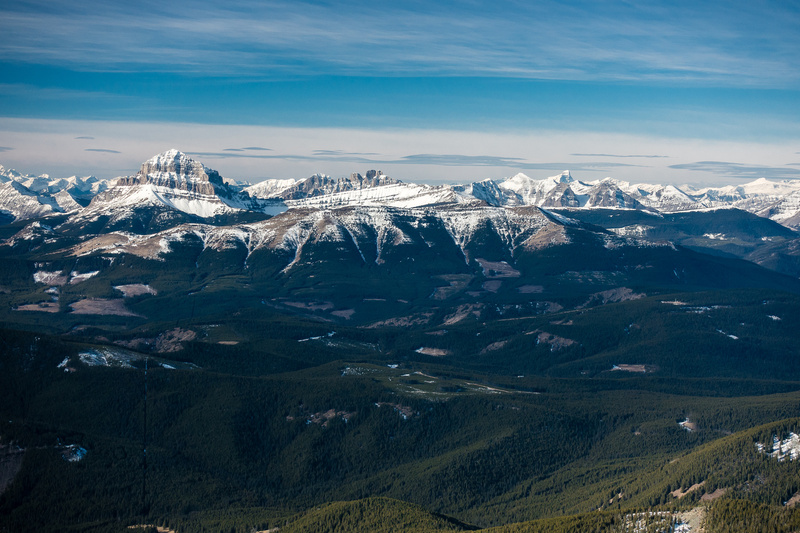 The Flathead Range including Coulthard, Ptolemy, Darrah, Andy Good and Sentry at left and the High Rock Range including Tecumseh, Crowsnest and Allison at right. 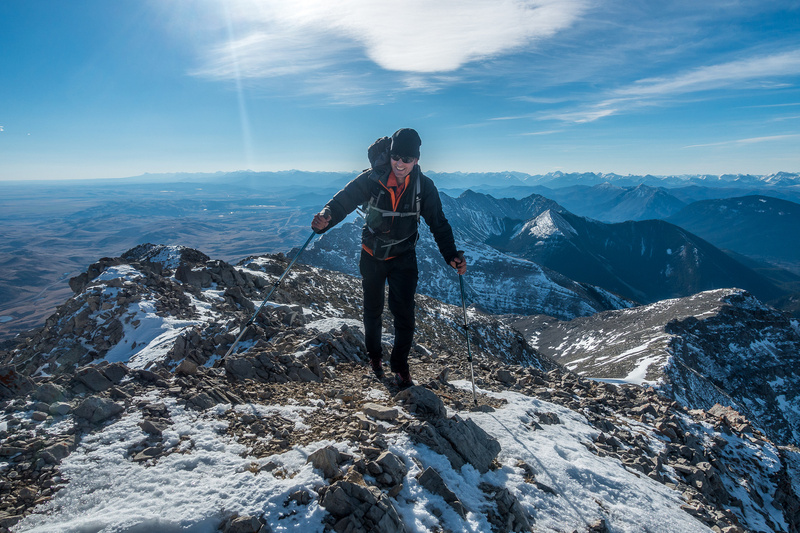 After enjoying the views from a very windy summit, it was time to turn our attention to the descent and possible ascent of Caudron Peak. We enjoyed the warm sunshine as we descended the easy south ridge towards the scree slope we’d utilized to gain the ridge on ascent. 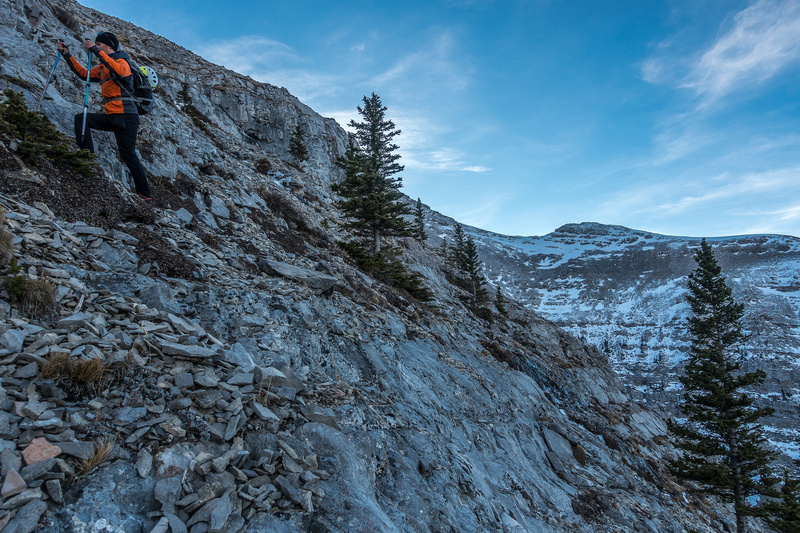 We were a bit surprised by some of the slabby cliffs lower down in the scree bowl (we’d missed these on ascent when we went too far up Caudron Creek) but found mostly easy scrambling paths through them. We started traversing a bit to skier’s left as we got closer to the creek in order to put ourselves in a good position to ascend Caudron. We weren’t feeling 100% like another 400-500m of height gain but the weather was fantastic and the route looked pretty good so we knew we’d have to give it a shot! 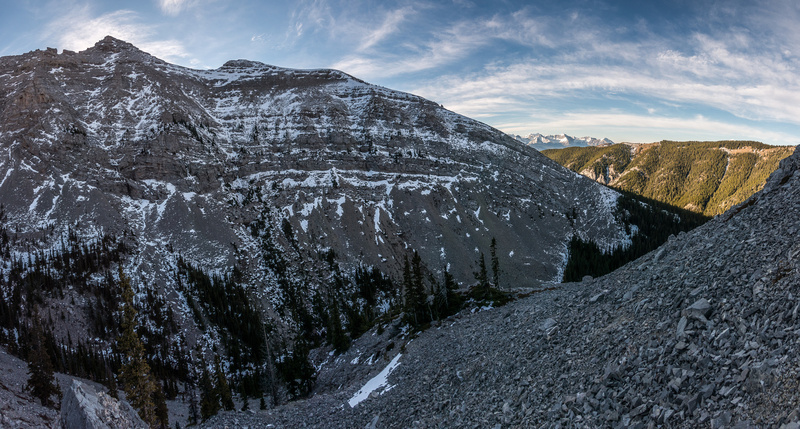 Looking down the scree slope to Caudron Creek. Some hidden cliff bands near the bottom. Caudron in the background. 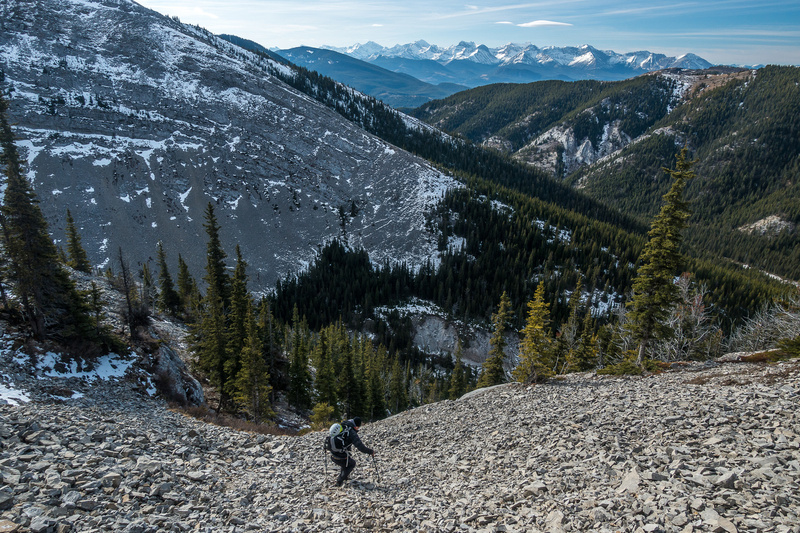 Once we finally thrashed our way through some annoying alder bushes in Caudron Creek, we found ourselves with a 450 vertical meter height gain on Caudron Peak. I was feeling much better than expected and Phil grudgingly agreed that it was definitely worth giving it a go while we were in the area anyway and started leading the way upwards. 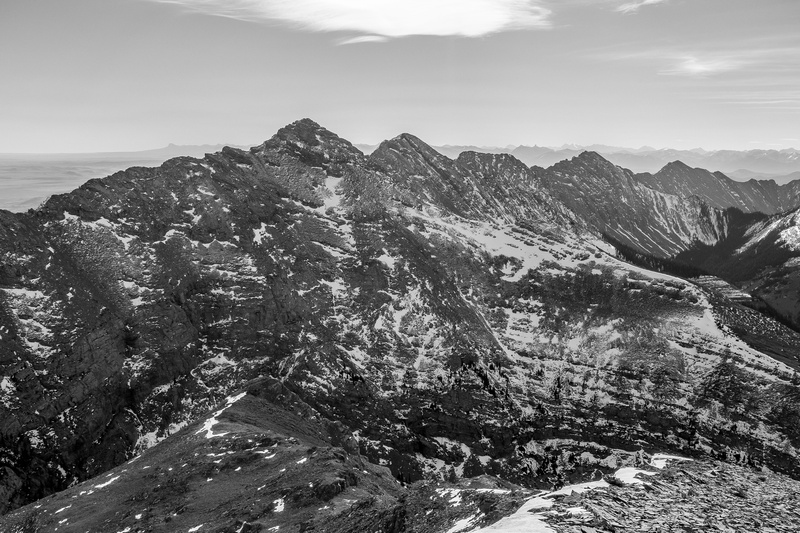 Centre Peak is the highest peak in the Livingstone Range and well worth the efforts required to reach its summit. 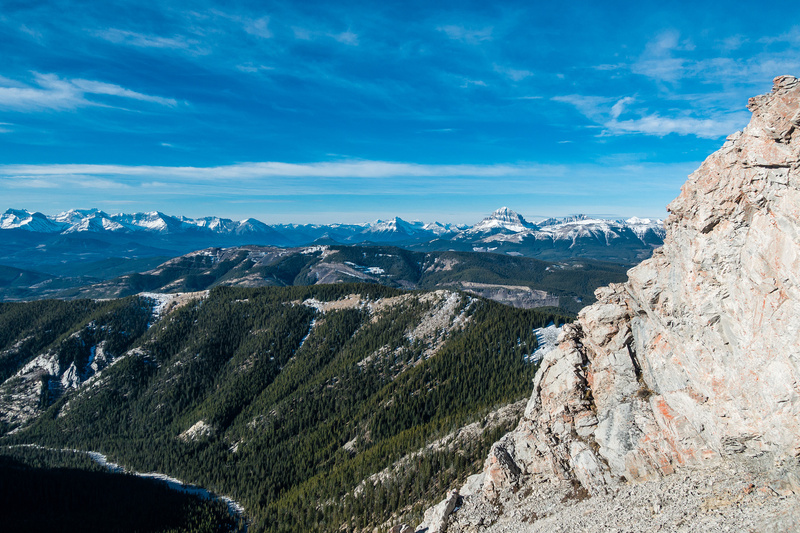 A highly recommended scramble in the Crowsnest Pass area and one of my favorites. We start our day by hiking up this road, through private property that we had permission to cross. Morning sunrise and Grassy Mountain - this will be the site of a massive open pit coal mine if Riversdale Resources can get the necessary permissions. 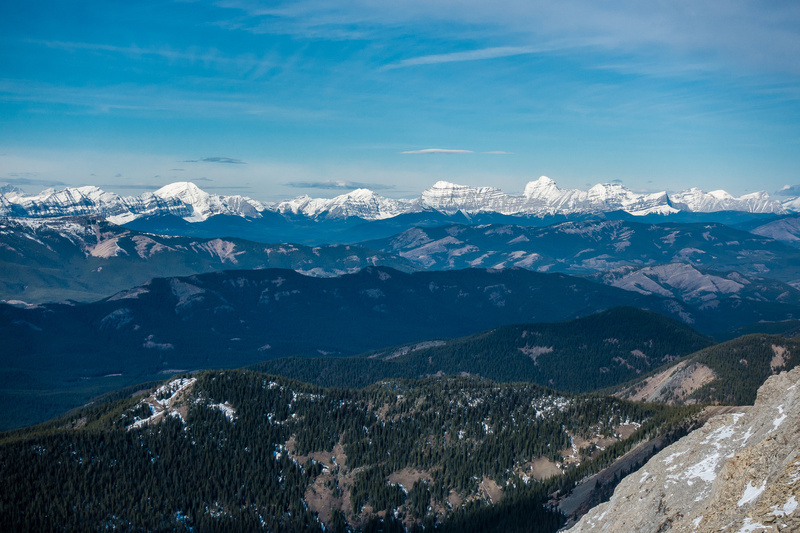 Looking southwest towards the Flathead Range including Coulthard, Ptolemy, Andy Good, McLaren and Parrish. Part of Centre's ridge above Phil in the distance, Caudron rises almost out of sight at right. We would descend slopes to the right at the end of the day. Hiking through a very open and friendly forest at valley bottom. In the rocky creek bed. Brandon's approach ridge at upper left and leading to Centre's west ridge at center and upper right. Caudron Creek reminds me of Jura Creek here - this is looking down as we start escaping the creek to the south ridge of Centre. 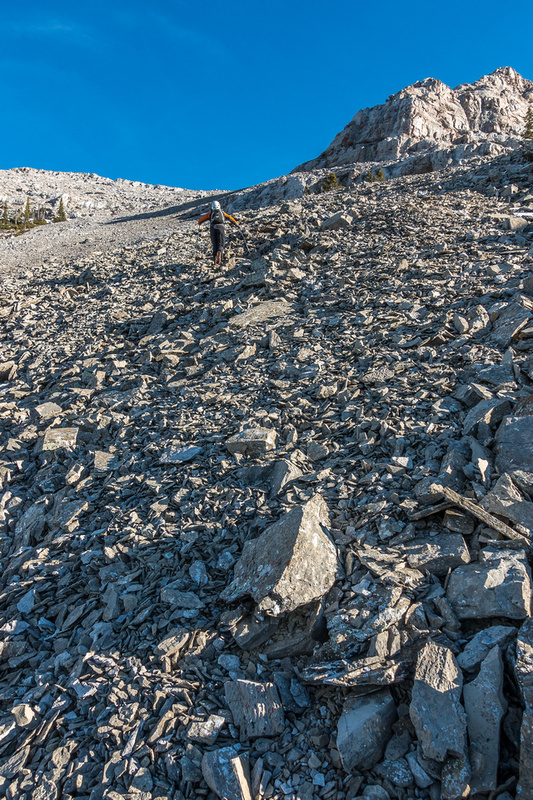 Traversing to the scree bowl that grants access to the south ridge of Centre (out of sight at right). This is looking south across Caudron Creek to Caudron Peak at upper left. We got lucky by avoiding any difficult terrain either above or below us as we traversed back to the west (L) before finding the scree slope leading up to the south ridge. Caudron at upper left and our access route up Caudron Creek visible in shadow below at lower right underneath Brandon's approach ridge. On the south ridge proper, looking ahead to the summit at center distance. Easy scrambling on the south ridge. Looking off the south ridge over Brandon's approach ridge and Caudron Creek at lower left. Crowsnest Mountain in the distance. Looking back down the south ridge directly towards Caudron Peak. Caudron Creek at lower right. Looking west and north along the Livingstone Range as we approach the summit - still a long ways off. Phil fights strong winds near the summit. It's a long way down to the east! 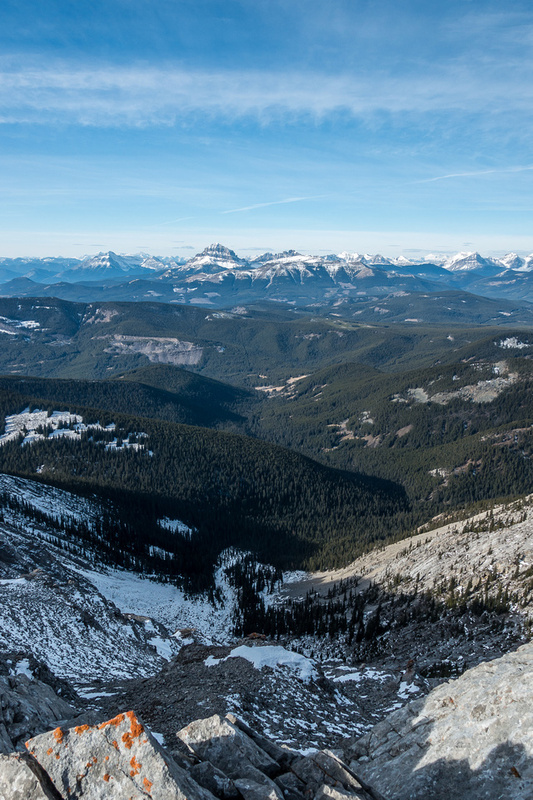 Great views north (L), east (C) and south (R) from the summit of Centre Peak. Farms and properties to the east of Centre Peak. 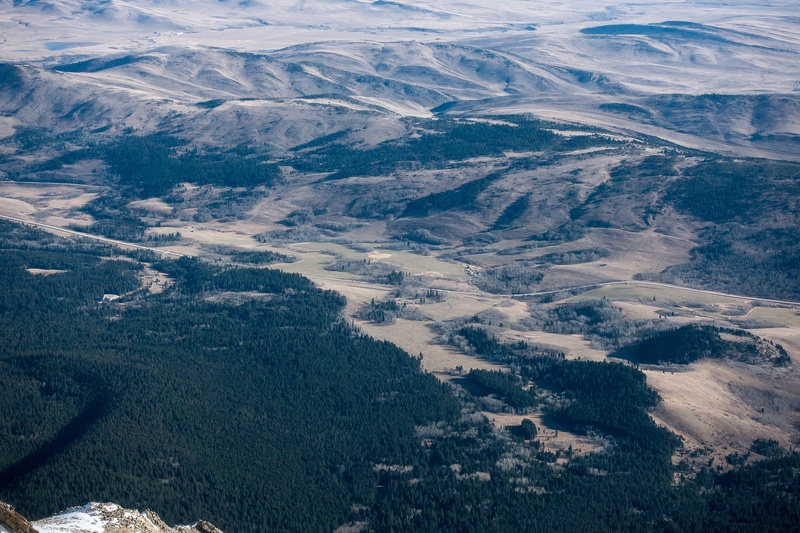 he Flathead Range including Coulthard, Ptolemy, Darrah, Andy Good and Sentry at left and the High Rock Range including Tecumseh, Crowsnest and Allison at right. Crowsnest at left with Tornado at far right. In between lie peaks such as Racehorse, Domke and Erris. Phil sits just under the summit, taking in the spectacular views to the west. Our ascent ridge at far left. Looking back up at the large summit cairn / plaque and north up the Livingstone Range as we start our descent. Phil starts down the south ridge with Caudron Peak above him. 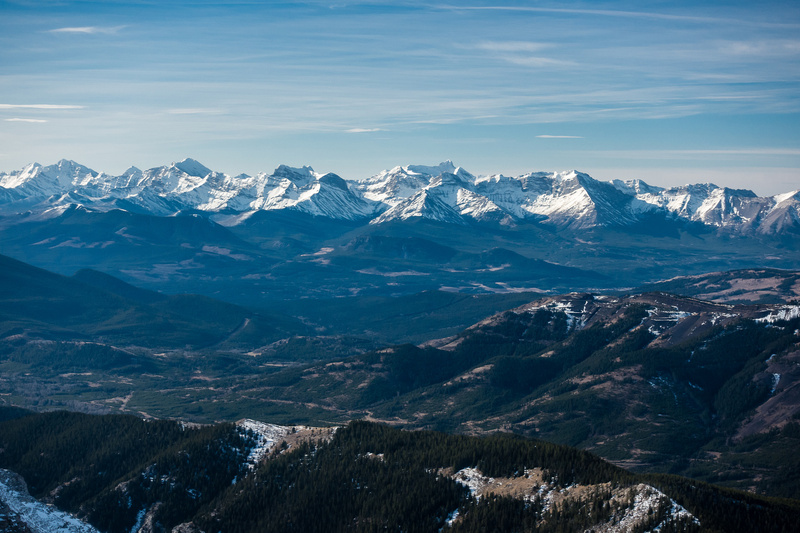 Great views to the west of the Flathead Range. 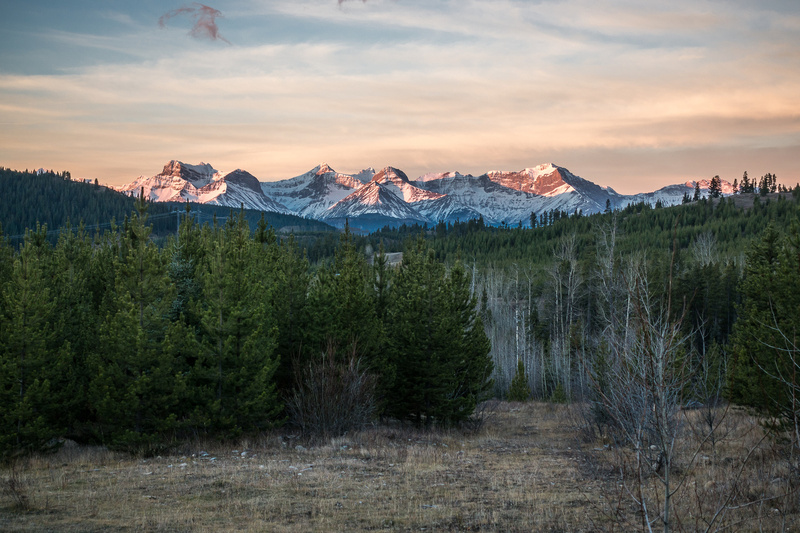 Looking over Caudron Peak towards the Castle / Crown Wilderness Area. The south ridge at lower left with Caudron now higher than us again. Fun scrambling on the ridge. 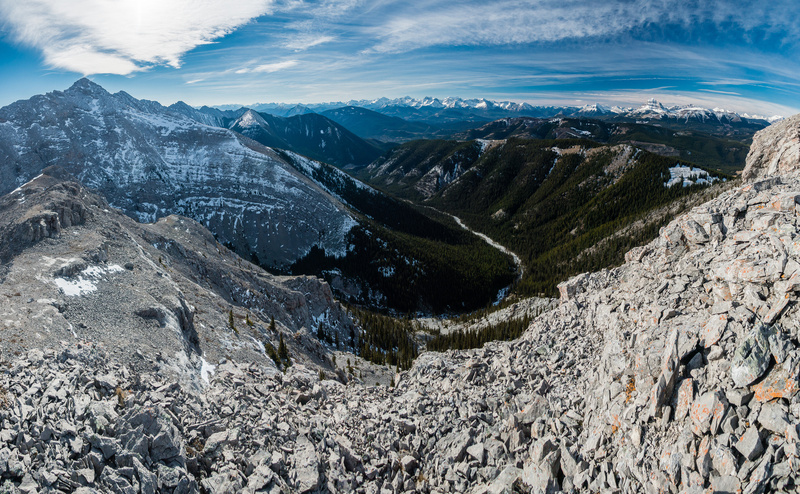 Looking down Caudron Creek (our approach route) and Brandon's approach ridge. The south ridge of Centre at left and Caudron at upper left. I can't get enough views of Tecumseh (L) and Crowsnest Mountain.